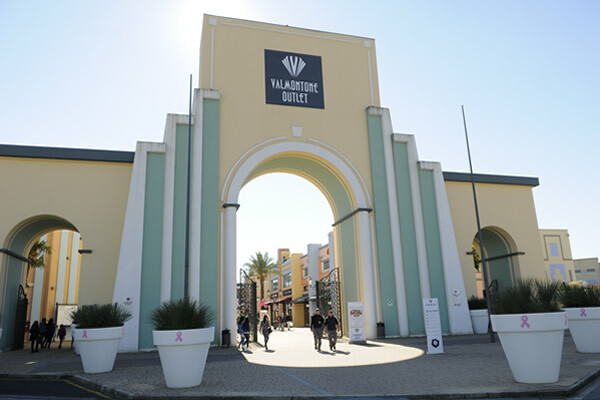 Valmontone Outlet is the place to go for shopping, relaxation and fun! With its 180 brand stores discounted year round from 30 to 70%, Valmontone Outlet is the perfect stop for an enjoyable break and the ideal destination for a shopping tour a few kilometers from Rome. Adidas, Baldinini, Braccialini, Breil, Calvin Klein, Caractère, Clarks, Coccinelle, Desigual, Enrico Coveri, Gattinoni, Geox, Harmont & Blaine, Levi’s, Liu Jo Uomo, Luisa Spagnoli, Marina Yachting, O Bag, Piquadro, Puma, Samsonite, Sandro Ferrone, Superga, Triumph, Twin Set, United Colors of Benetton, Villeroy & Boch and many more. The Valmontone Outlet roundtrip shuttle bus service runs from the city center of Rome.